Hello everyone!!!!! Apologies I have really been AWOL! I have had a HECTICLY busy weekend and you all will hear about it very very soon....with pictures... :-D. BUT before then, permit me to formally launch the Fashion Entrepreneurship Course (Vol. 2). Yes the 1st one was a success and I am still basking in its euphoria but I know this 2nd one is where our creative juices begin to flow! Volume 1 was simply an introduction. Volume 2 is where the REAL work begins! So what are we discussing on the 31st of March @ Planet 1?! I'll tell you! Yup! I guess the heading speaks for itself. We are teaching people how to draw!!! Have I ever told you guys my story?! Gosh I should tell you on this blog sometime. I could not draw a straight line without a ruler before I went off to Fashion School. I taught myself how to draw! And guess what?! See that image in the poster?! I drew that myself! And guess what?! 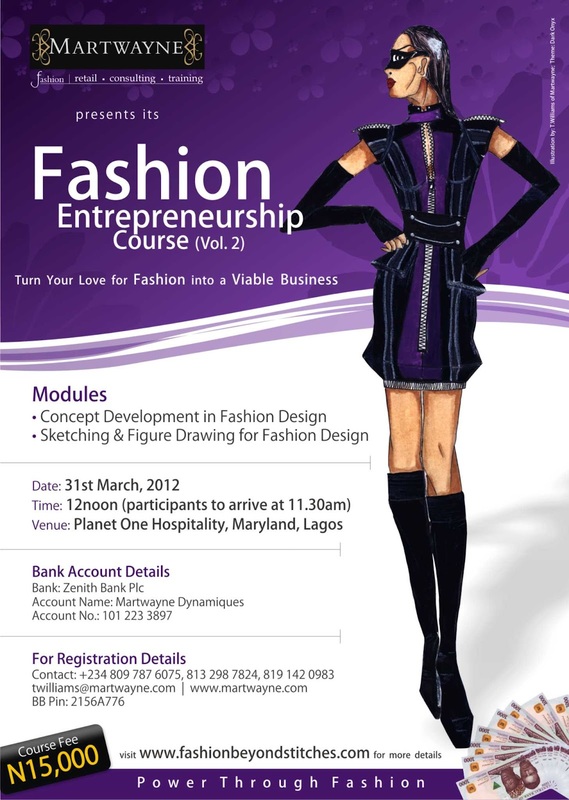 You can also be better once you understand the principles surrounding how to draw a fashion figure. And these are the principles I will be teaching in this module. And you really have to be there! And where is there?! I'll give you the full details just now. Venue: Planet 1 Entertainment, Maryland, Lagos. Course Fees: N15,000 (this includes training materials, some tools for your sketching exercise and light refreshments). AND if you are coming for the 1st time but bring a friend along, then you are also entitled to a discount. Simply pay the course fees of N15,000 into the "Martwayne Dynamiques" account, number 101 223 3897 at any Zenith Bank branch. Your discount, if you fall into any of the above categories, will be refunded to you on the 31st when you come for the course. So people! Get ready to have a FAB time on the 31st. I look forward to having you over! See you @ Planet 1! I am so interested to be a part of this course. I just finished my fashion schools in Texas but I still want to explore more on fashion designing to perfect my craft.